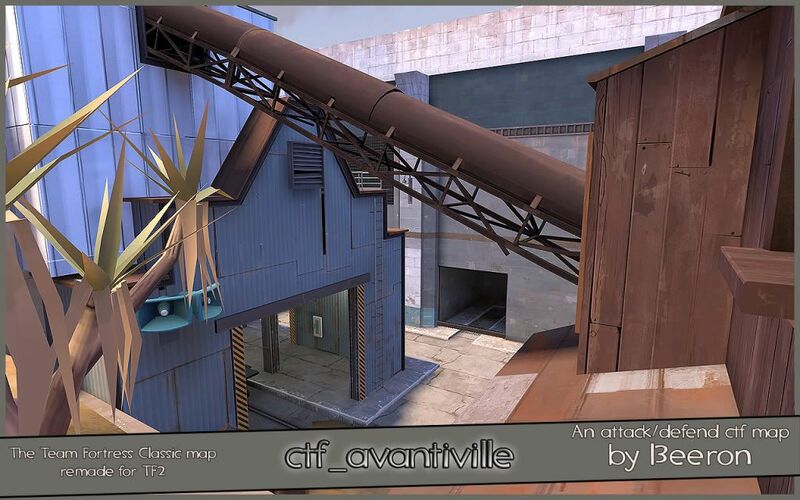 This map has been a long time in the works. Partially due to my busy life and my current trend of stumbling through Hammer's building process. But, I have been persevering and have kept at it. The map has been through many many configurations and iterations. So, if you haven't played it in a while, check out the new version! This is my attempt to create fun gameplay based around my favorite map from Team Fortress Classic. Using the "Plant the flag" game mode, it acts like a ctf attack/defend map. With advancing spawns the battle moves through out the map as Blu makes progress. Blu and Red have been neighbors for decades, carrying on with their everyday drivel of a booming commodities industry in harmony. Blu's covert operations and espionage have uncovered Red's massive plot to take Blu over. Blu has decided to eliminate the threat with their own team of mercenaries. Blu is trying to claim each of Red's 4 key tactical areas by planting their intelligence at the capture points. Can Blu catch red off guard and bet them at their own game?